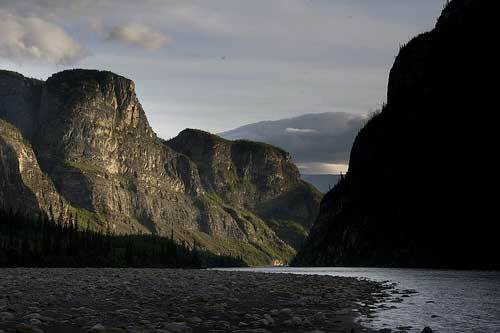 The most common way of seeing the South Nahanni River is by flying in and canoeing or rafting parts of the river. Most visitors fly into Virginia Falls and spend 5-7 days floating down the river to Nahanni Butte or Blackstone Landing. 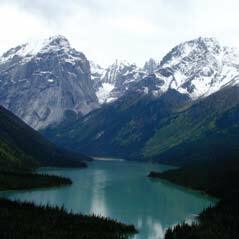 I want to follow the river from the source to its confluence with the mighty Liard River which later will merge with the even mightier Mackenzie. Flying in seems a bit like cheating, don't ask me why. I have flown on other occassions but this time it does not seem right. Besides, if I was smart I would not be doing this anyway. And what good is a packraft if you do not carry it part of the way? It all started some 15 years ago, when some Canadian friends sent me Dangerous River by RM. Patterson. Great story, to be recommended. This book started me putting South Nahanni on my wish list, or 'life list'. Last year I had plans on going east, into Russia. That changed though. At a Christmas lunch some friends who had been through a grueling time mentioned that, nowadays: "If we have 10-15 bottles of different wines at home, we alwas take the best one first". This stayed with me, and shortly afterwards I realized that I was not at the age where I should be putting the Nahanni off any longer. The Nahanni is roughly 600 kilometers or river, starting at the Moose Ponds near the border of Yukon, in the Northwest Territories. There are excellent maps here. Search for the Moose Ponds NWT and enlarge to your hearts content, and you can get topographic maps of the whole river. It is a national park that has recently been enlarged to some 30 000 sq kilometers, or equal to the size of Belgium. No one lives in the park, but there are a couple of cabins with park wardens during the summer. On the Yukon side there is a road, North Canol Rd, which is a gravel road from Ross River to the border. From the border to Norman Wells the road is only a trail, The Canol Trail. This road is not particulary well traveled, and bridges are prone to be washed away. I thought it would be easy to find someone in Ross River to drive me up the Canol Rd, but I have not managed to get in touch with anyone in the community. Not even writing the RCMP has resulted in anything. Luckily I have good friends in Canada that are helping out. 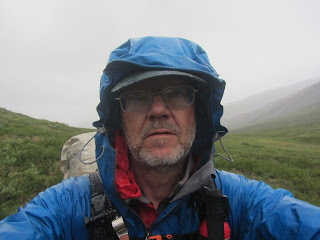 In fact, two of them will drive me from Whitehorse up along Canol Rd to my trailhead just before MacMillan Pass, where the South MacMillan river takes a 90 degree turn after coming out of a gateway in the mountains. From there on I will walk. It is approximately 50 kilometers of what is endearingly called bushwhacking from Canol Rd to the Moose Ponds. Close to the road I will have to cross the MacMillan river and then find my way through a pass that sits on what is the last remnants of the Continental Divide. This is where the Rockies sort of peter out into the Arctic Ocean. 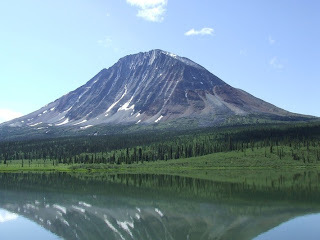 This divide is also the border between the Yukon and the NWT. Portrait Lake is one of the few lakes with names in this area, and it sits in the pass that I will go through on my way to the Moose Ponds. 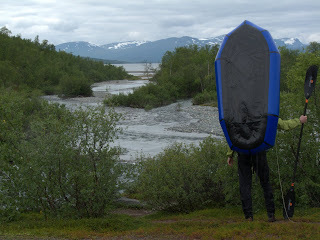 In the Moose Ponds I will inflate my packraft and make my way down the Nahanni. From what I hear a handful of canoe parties every year fly into the Moose Ponds and make their way along the same route as I intend. This is usually a three week undertaking, starting out with about 50 kilometers of continous whitewater in the Rock Gardens. After this the river is swift-flowing, with occassional riffles more or less down to Virginia Falls. About halfway is Rabbitkettle Lake, where I have a cache of food waiting for me (I sincerely hope). 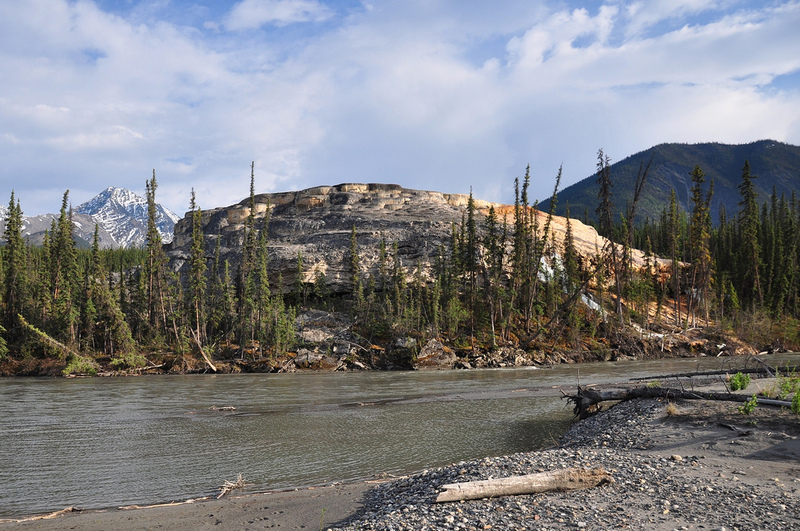 At Rabbitkettle are the famous tufa mounds, one of several unique landforms along the Nahanni. This area of the river, down to Virginia Falls, is reputedly rich in wildlife sightings. The number of people on the river will probably increase, since Rabbitkettle is a more common place to start a canoe trip than the Moose Ponds. By this time I will have about 300 kilometers of wilderness travel under my belt. Downstream of Virginia Falls the river changes character quite a bit. This is where the magnificent canyon system starts. 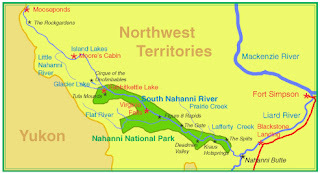 In these parts the Nahanni is an antecedent river, meaning it has not carved its way through the rock, but maintained most of its meandering course in spite of the mountains having slowy lifted in its way during the eons. The Grand Canyon has been created the same way. 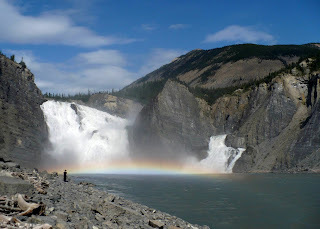 Most people travelling the Nahanni flies into Virginia Falls and spend 5-7 days drifting down the river. These lower parts of the Nahanni are also the ones written about in Dangerous River and other books. The McLeod brothers were found headless in the beginning of the 20th centhury and the placenames Headless Creek and Deadmen Valley were established. Hot springs in a number of places along the Nahanni also created legends of a Shangrila in the mountains, where winter never came. There are four canyons below Virginia Falls, and the last one is called First Canyon. Logical if you realise that the first explorers, like Patterson and Faillie, came up the river tracking or poling. This was the first canyon encountered and it is also the one with the most imposing walls, up to 1300 meters of them going more or less straight down into the river. 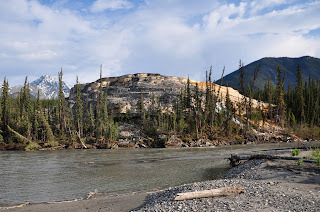 Then the river slows down and flattens out in the infamous The Splits, where currents, sweepers and strainers wait for the unwary, until the small community of Nahanni Butte is reached and the Nahanni joins the Liard. This is the plan. More about the gear later. PS. Note that the photos in this article are not mine. I've tried to pick photos that are available in the public domain. If I have made a mistake I apologize and will remove the photos if asked to do so. Wow... 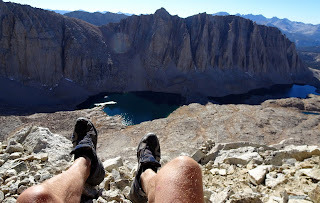 I do believe I have trip envy! It looks like it will be stunning!